The excitement in Bunscoil na Toirbhirte was palpable on Thursday 26th November as eleven of the pupils between the ages of seven and twelve set off for Dublin to participate in the most watched programme of the year on Irish television, “The Late Late Toy Show”. Eighteen lucky and talented children from the locality, who are all pupils of the Kilshanna School of Music and Arts, succeeded in qualifying to get a place on the show, after their auditions last month in Cork. 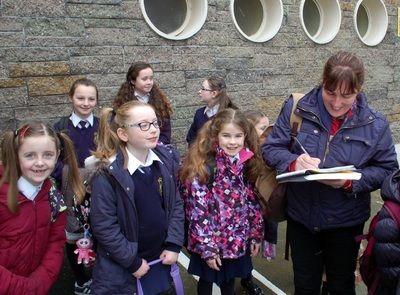 This is a remarkable achievement, and all in Bunscoil congratulate Pearl and her team in Kilshanna on this marvellous experience for the pupils concerned, and the community at large. 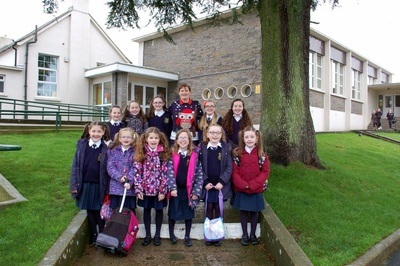 All the pupils filed into the Halla at 10.30 and the eleven children came to the top of the Halla. Everyone gave them a huge bualadh bos, and Ms. Hayes-Brennan (who was wearing her Late Late Show Christmas jumper) wished them well and told them how much she enjoyed watching the toy show for the past FIFTY YEARS! She said when she was their age she used to watch it on a black and white television, and remembered the first “experimental colour transmission” when she was a young teenager. 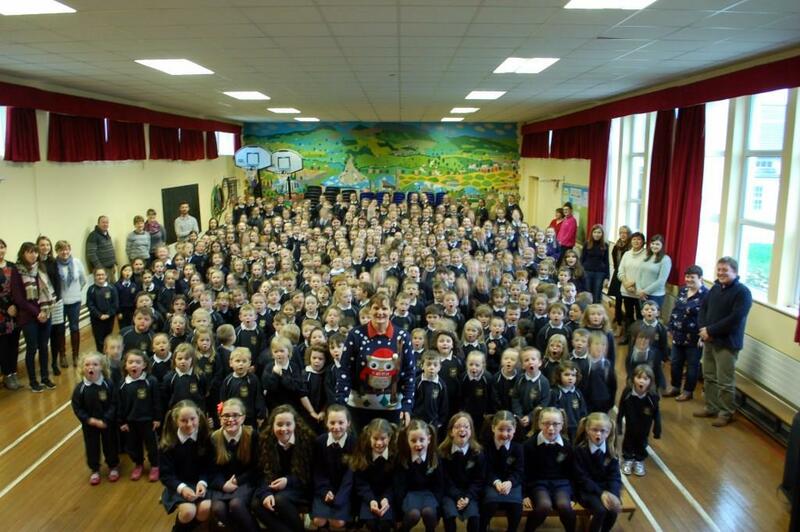 Everyone sang “For they are jolly good fellows” and “We will watch the Late Late Toy Show” (to the same air). At this stage the girls sat on a bench and Ms. Linehan took their photo with the whole school. 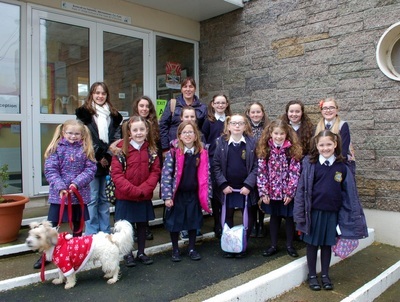 Shortly afterwards Pearl, with her music teachers and the pupils from other local schools (including four boys who are past –pupils of Bunscoil) called with Charlie, their little dog and their mascot. Ms. Hayes-Brennan asked Pearl to sign the girls out, and took her photo, claiming that in years to come this would be a very important historical record for future generations.